How Managers Make Things Happen 1) Two Kinds of Decision..
Decision making is a process of choosing the best alternatives among many. 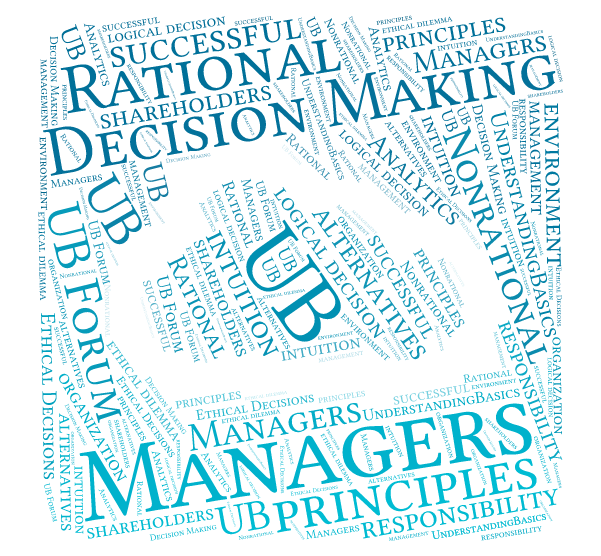 Managers follow two types of models in making decision which are rational and nonrational. In rational model assumes that the managers will make logical decision, there are four steps which are first identifying the problem/opportunity, second is generating alternatives, third is evaluating the alternatives and selecting the best alternative and the last step is implementing the best alternative and evaluating the chosen solution. 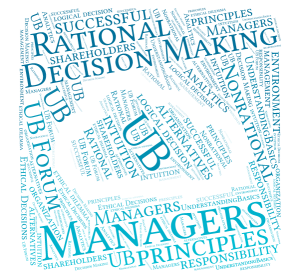 In the nonrational models assume that decision making is mostly uncertain as future is always unpredictable. There are three nonrational models which are satisficing, incremental, and intuition. Evidence-Based Decision Making & Analytics means that the organization is to bring rationality in its decisions and apply the best practices as its principles. Jeffrey Pfeffer and Robert Sutton have identified seven principles for successful implementation of evidence-based decision making which are treat your organization as an unfinished prototype;”no brag, just facts”; see yourself and your organization as outsiders do; have everyone, not just top executives, be guided by the responsibility to gather and act on quantitative and qualitative data; you may need to use vivid stories to sell unexciting evidence to others in the company; at the very least, you should slow the spread of bad practices; and you should learn from failure by using the facts to make things better. However there are seven reasons behind best decision not being implemented which include too much evidence presence, not enough good evidence, the evidence doesn’t quite apply, people are trying to mislead you, you are trying to mislead you, the side effects outweigh the cure and stories are more persuasive, anyway. There are different decision making styles, depending on the manager’s perception and response to information, which are directive, analytical, conceptual, and behavioral. The corruption in the corporate world has highlighted the ethical dilemma in the organizations, now there are ethical officers in the organization for the guidance of employees and a manager should himself analyze his options and alternative in decision making which are legal and increase the value of the company for the shareholders. The managers may react to an opportunity or problem in two possible ways which are ineffective way and effective way. In ineffective way managers follow these reactions which are, in relaxed avoidance, a manager decides to take no action in the belief that there will be no great negative consequences; in relaxed change, a manager realizes that complete inaction will have negative consequences but opts for the first available alternative that involves low risk; in defensive avoidance, a manager can’t find a good solution and follows by procrastinating, passing the buck, or denying the risk of any negative consequences and in panic, a manager is so frantic to get rid of the problem that he or she can’t deal with the situation realistically. However for managers to make effective decision making, the manager needs to evaluate the urgency of the situation, the credibility of the information and priority of the situation. There are some barriers which restrict managers from taking effective decision and these are availability bias, confirmation bias, representativeness bias, sunk-cost bias, anchoring and adjustment bias, and escalation of commitment bias. Groups allow organization a better environment for decision making process because of greater knowledge pool, different perspectives, intellectual stimulation, better understanding, and deeper commitment. However it also have disadvantages like few people dominating the group, less accurate assessment of the situation, satisficing and goal displacement. There are some characteristics of groups which are less efficiency; size affects decision quality, over confidence and ample amount of knowledge. Participatory management is a technique which can increase employee’s efficiency. There are three techniques which help managers in solving problems which are brainstorming, Delphi technique and computer aided decision making.